Jixi County (jì xī xiàn 绩溪县) is located in the south of Anhui Province (ān huī shěng 安徽省), belonging to "the Six Counties of Huizhou (huī zhōu liù xià 徽州六县)". 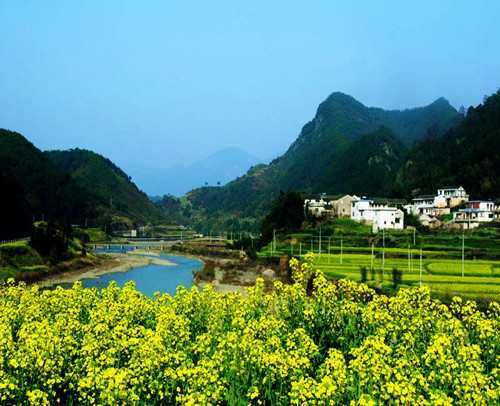 As an origin of Huizhou Culture (huī zhōu wén huà 徽州文化), Jixi County is considered homeland of Huizhou Cooks (huī chú 徽厨). Characterized by hilliness, it is contiguois to Huangshan Mountain (huáng shān 黄山), She County (shè xiàn 歙县), Jingde County (jīng dé xiàn 旌德县), Zhejiang Province (zhè jiāng shěng 浙江省), Xuancheng City (xuān chéng shì 宣城市) and Ningguo City (níng guó shì 宁国市). All in all, Jixi County is a place of national histories and cultures. Langya Mountain (láng yá shān 琅琊山) National Forest Park is one of the first National Forest Parks in China and a key protected secnic zone that located in the east of Anhui Province (ān huī shěng 安徽省) and the southwest of Chuzhou (chú zhōu shì 滁州市). 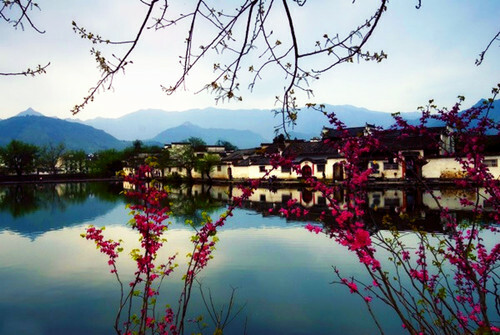 Bounding on the nearby city Chuzhou in such a harmonious way, this area belongs to one of Anhui's five widest scenic zones. Hong Village (hóng cūn 宏村) is located on the southwest of the foot of Huangshan Mountain (huáng shān 黄山), 11 miles from Yi County (yī xiàn 黟县) in Anhui Province (ān huī shěng 安徽省). The name of the village which is a bull-shaped antique one belonging to the Land of Peach Blossom (táo huā yuán 桃花源) of old Yi County symbolizes expansion and prosperity. 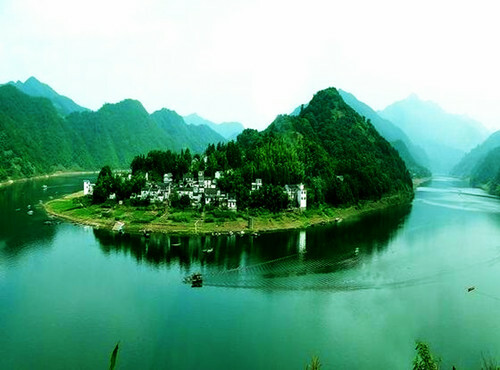 It has a long history of more than 900 years featuring green hills and limpid river. Therefore, people always call it "A Village In Chinese Painting (zhōng guó huà lǐ de xiāng cūn 中国画里的乡村)". She County (shè xiàn 歙县), located in Huangshan City (huáng shān shì 黄山市) and the south of Anhui Province (ān huī shěng 安徽省). It belonged to the six counties of Hui State (huī zhōu 徽州) and was the location of Hui State Government (huī zhōu zhì fǔ 徽州治府) in ancient times. As a birthplace of Hui State Culture, it is the origin of Peking Opera (jīng jù 京剧) and a leading producer of Hui China Ink (huī mò 徽墨) and She Inkstone (shè yàn 歙砚) which belong to the four stationery treasures of the Chinese study. Anyway, it is an important county for Chinese history and culture. 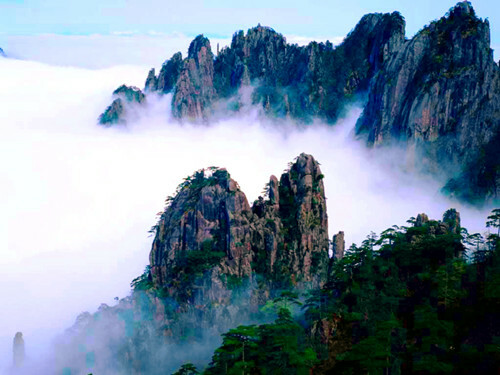 Huangshan Mountain Scenic Zone (huáng shān fēng jǐng qū 黄山风景区) is located in Huangshan City (huáng shān shì 黄山市), Anhui Province (ān huī shěng 安徽省), 69 miles from Tunxi District (tún xī 屯溪), covering She County (shè xiàn 歙县), Xiuning County (xiū níng 休宁), Yi County (yī xiàn 黟县), Huangshan District (huáng shān qū 黄山区) and Huizhou District (huī zhōu qū 徽州区). 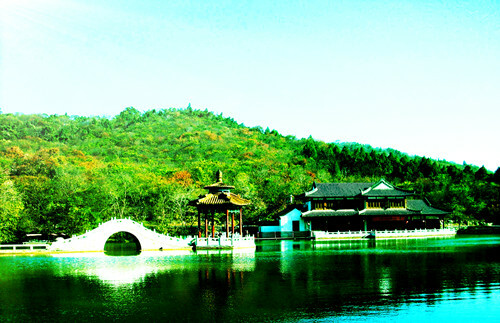 In 1985, it was classified as one of the 10 popularest scenic attractions in China and in 1990, it was officially placed in the "World Cultural and Natural Heritage".